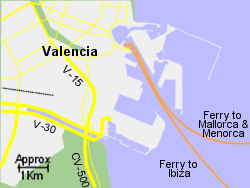 Map of the Valencia Ferry Port area. 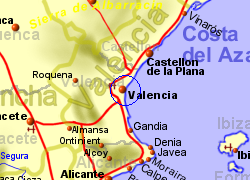 Valencia ferry port is located on the edge of the city, approximately 4km from the main train station and 15km from Valencia airport. 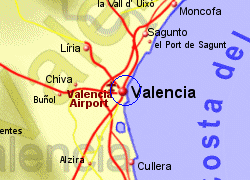 Valencia also has a metro/tram system running close to the port area. Road connections from the port are good with the V-30 trunk road linking to the major roads that radiate out from the city. There are regular bus services from the port area. Valencia port area has been host to the Formula 1 Grand Prix in recent years. Operated by Balearia with 7 crossings per week, crossing time 8 hrs. Also operated by Acciona with 5 crossings per week, crossing time 8 hrs. 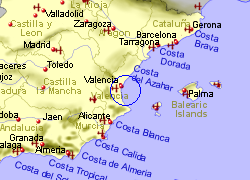 Operated by Balearia with 4 crossings per week, crossing time 3.5 hrs. Also operated by Acciona with 8 crossings per week, crossing time 3 hrs. Operated by Acciona, 6 crossing per week, crossing time 6.5 hrs. Operated by Acciona, 1 crossing per week, crossing time 15 hrs.